It wasn't until 1853 that Smethport officially was incorporated as a borough. Prior to this, Smethport was simply a settlement surrounding the county courthouse. building were 50 feet wide and 75 feet deep with a cost of $16,000. 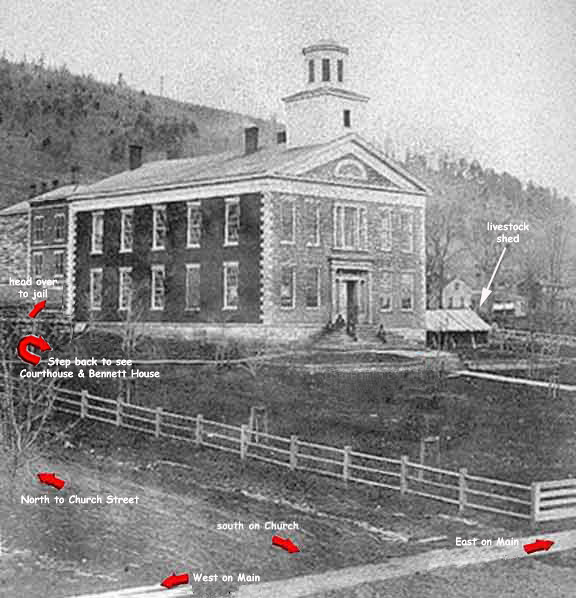 Just as with the 1826 courthouse, the new courthouse was also built by the gifted Solomon Sartwell. A few years following the structure’s completion, a small, dark, damp brick vault was constructed for the storage of official documents. It served its purpose until the boom in the Bradford oil fields swelled the county's population. In the years between 1874 and 1881 the county's population climbed from less than 10,000 to over 45,000. The need for better safekeeping of documents led to a new courthouse. It was completed in 1881 at a cost of $80,000. Buffalo architect Milton Earl Beebe was hired to design the project. Beebe had considerable experience and fame, and the retaining of such a noted archictect indicated the new found importance and wealth of the county. In addition to the McKean County Courthouse in Smethport, Beebe also built the courthouses for Warren, Cambria, Elk and Huntingdon Counties in Pennsylvania as well as dozens of important structures in the Buffalo area. Bucktails Formed April 18th, 1861! The friends of the Union and Constitution of the United States, without distinction of party are solicited to meet at the Court House, in Smethport, this evening, at the ringing of the bell, to consider the present state of the country and take action in relation to the same. Col. Kane , of Philadelphia, will be persuaded to address the audience. Pursuant to the above call, a large number of the citizens of Smethport and vicinity assembled at the Court House, on Thursday evening, the 18th inst. The meeting was called to order by P. Ford, Esq., who nominated Hon. B.D. Hamlin for Chairman. On motion, J.E. Blair, S.C. Hyde, P. Ford, P.E. Scull, J.R. Chadwick, Henry Hamlin and A.N. Taylor were chosen Vice Presidents, and W. Cowler and C.K. Sartwell, Secretaries. W.A. Williams, Esq., being called upon stated the object of the meeting in a few brief and patriotic words, and closed by moving the appointment of a Committee of three, to wait upon Col. Kane, and invite him to address the assemblage. The Chair appointed W.A. Williams, W.Y. McCoy and Geordis Corwin said Committee. On the return of the Committee, Col. Kane was introduced to the audience by W.A. Williams. The Colonel regretted, on taking the stand, that his first appearance before an audience in North western Pennsylvania Was for the purpose of asking his hearers to go to war. He reviewed the thrilling scenes of the past few days, and indignantly denounced the action of the Confederate troops in inaugurating civil war, firing upon Fort Sumter, and compelling the gallant Anderson to lower the flag of the Union. He then read the Proclamation of the President of the United States, calling upon the several States for Volunteers, to the aggregate number of 75,000 and also the correspondence between Gov. Curtin and himself, in which he was commissioned to raise a force of 100 Volunteers in the counties of M'Kean and Elk, for the purpose of assisting to maintain, unsullied, the honor and dignity of the Government. He believed that the organization of an effecitve force would be the best prevenative of war, that the duty and safety of our citizens, without respect of party, lay is sustaining the government, and confidently hoped that the united rally of the people, to sustain the Executive, would restore harmony and peace, and make as once more a happy and salted people, without the shedding of fraternal blood. His remarks were listened to with marked attention, and frequently elicited the hearty applause of the audience. 1. Resolved, That "the Union must and shall be preserved," that the laws of our country ought to be enforced by the Chief Magistrate of the nation, as far as the power to do so has been conferred upon him by the Constitution. 2. Resolved, That whatever may have been our individual positions and opinions on questions of policy which have heretofore divided our people, we now present a solid front, and pledge ourselves to aid the government in the performance of its every constitutional obligation. 3. Resolved, That, while we deprecate and deplore the shedding by brother of brother's blood, we yet find it to be a necessity that we should by all lawful means prepare to defend ourselves, our families, our homes and our government as established by its founders. 4. Resolved, That while a difference of opinion may exist among us as to the tone of President Lincoln's recent Proclamation, we all agree that a prompt response should be made to that portion which call for the furnishing of troops for the defense of our national Capitol, and the protection of the property of the government. 5. Resolved That we earnestly recommend the active young men of our county to enlist in the service of the government for these purposes. 6. Resolved, That it is with sincere gratification and pride we learn that Col. Thomas L. Kane has received orders for recruiting and organizing a company and is now here ready to receive volunteers. 7. Resolved, That we have the most unbounded confidence in the patriotism, gallantry and courage of Col. Kane, and most cordially recommend him as an officer who will lead his command only at the right time and in the right place. 8. Resolved, That Sheriff Blair, D.R. Bennett, Wm. Wilkins and Enoch Dulley be constituted a Committee to aid Col. Kane in the collection of the requisite number of men. 9. Resolved, That the president of this meeting be authorized and required in call another at an early day, to give forth expression of the popular determination to uphold and sustain the government of our country, as inherited from our fathers. On motion, the proceedings of this meeting were ordered to be published in the county papers. until the boom in the Bradford oil fields swelled the county's population. In the years between 1874 and 1881 the county's population climbed from less than 10,000 to over 45,000. The need for better safekeeping of documents led to a new courthouse. It was completed in 1881 at a cost of $80,000. Buffalo architect Milton Earl Beebe was hired to design the project. Beebe had considerable experience and fame, and the retaining of such a noted archictect indicated the new found importance and wealth of the county. 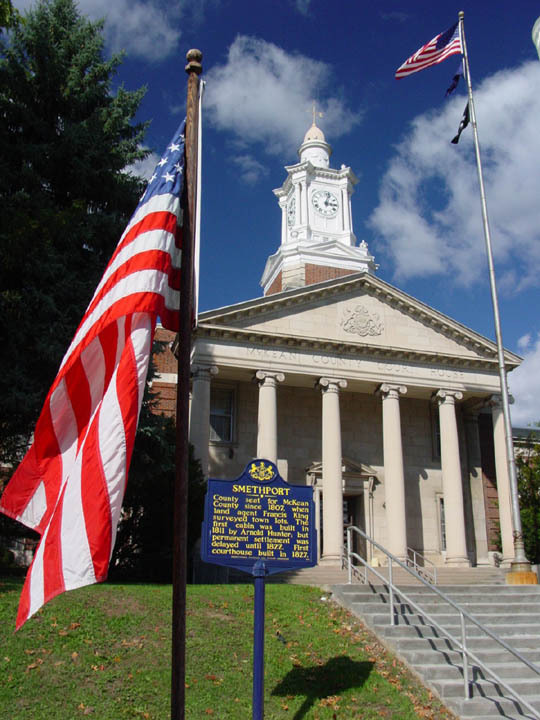 In addition to the McKean County Courthouse in Smethport, Beebe also built the courthouses for Warren, Cambria, Elk and Huntingdon Counties in Pennsylvania as well as dozens of important structures in the Buffalo area. February 12, 1940 found the magnificent building a smoldering waste, as flames leaped 130 feet in the sky, defying the efforts of firemen from Smethport, Kane, Mt. Jewett, Eldred and Port Allegany. A new courthouse was dedicated June 14, 1942 on that site. photo credit: Lester Jordan Jr.